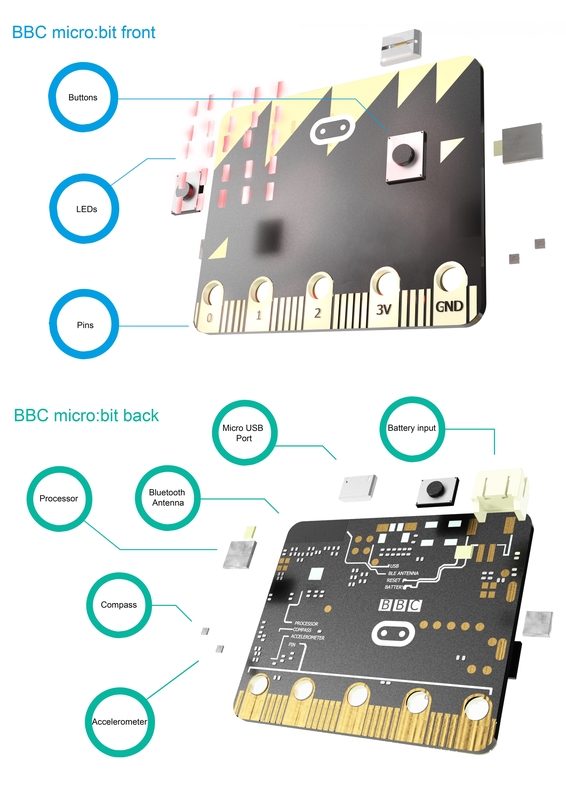 The BBC micro:bit is the spiritual successor of the BBC Micro of the 1980s, which itself introduced a generation of children to computing. The BBC micro bit carries on this 30 year tradition and does it 18 times faster and is 70 times smaller than its predecessor. 1 x USB Cable(For programming). Being comfortable with both the RaspberryPi and Arduino microprocessors I thought I would use this to introduce my Son to the idea of programmable systems; so I brought one for me, a development board to mess around with, and one for him, a stable board. The main thing I love about the Micro:bit is that you can get near-instant results from it, the first time you power it up the preloaded application will run and introducing you to the on-board features. The problems starts when you look for somewhere to program the device from. The only issue I have with the Micro:bit is that there are so many programming environments, some of which although fully documented and partially functional, have been abandoned with no note to that effect. However after some perseverance I was able to find a suitable ‘Beginners’ programming environment, using a colourful drag and drop interface, similar to scratch, and a low level programming environment, both of which are web based and very well documented. Thoroughly enjoying experimenting with this with my 10 year old who loves it too. He's programmed a buggy via Bluetooth and I think this is a great starter micro-controller before going to something more advanced like an arduino or Rasp Pi. Its easy to use, and so many things can be learnt - programming using block languages to full on c and c++, robotics and harware control with PWM, GPIO etc. It can even be used to control scratch characters. A fabulous piece of kit, and proto-pic has become my favourite place to purchase items - not just for the speed of delivery, which is superb, but also for the little bags of haribo! Awesome. This is my second Microbit and they are a great way to learn about micro controllers. Everything you need is in one small device that connects to any phone/ computer via Bluetooth or cable. My son is now learnign this at school so we bought a couple for him to try things out at home. It really is impressive. The leds on the back can allow him to print little emoji like faces and messages but arent really laid out well enough to create instantly recognisable letters and numbers - other than that, great! Bit silly selling the board when you need a battery pack and USB connector at the very least yo make progress. The BBC have outdone themselves here. Its a great fun board, my 7 year old is able to make things blink and flash and is now better at programming than I am.